Heading off to Rhinebeck Sheep and Wool Festival this morning! I have had such a wonderful time with Dawn over the last week and a bit, both on our trip to Horst and then staying with her and her family in Plainwell and during the workshops in Kalamazoo. It was really hard saying goodbye at the airport (Americans are a BIT more emotional than us cold Irish!) and heading on for Minneapolis but great to arrive safely to a VERY wet destination and meet another blog reader Heather! I was lucky enough to arrive in time to go straight to the opening of an art exhibition at Heather’s work place and see the gorgeous hat she has displayed there which lookes absolutely marvellous. Heather in her gorgeous hat! We then drove to a great Italian restaurant for a tasty meal before returning home for an early night in preparation for all the exciting fibre madness that is going to take place this weekend at the Rhinebeck Sheep and Wool Festival in NY! 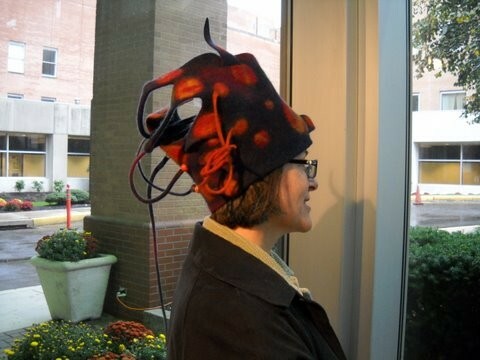 This entry was posted in Uncategorized and tagged Felt, felt hat, Felting, Rhinebeck Sheep and Wool Festival. by Nicola. Bookmark the permalink. Hey, I recognize that beautiful hat…Oh, it’s a walk down memory lane and I love it (and Heather, too)…I know the two of you will have a grand time together in Rhinebeck. I surely do miss you. I’m heading out to the studio tomorrow morning to get to work on the jacket that I started with you Wednesday. Hope it doesn’t turn into another purse disaster:-) Can’t wait to see your piece when you get it all finished…It’s stunning and is sure to be a real head-turner. Enjoy your last couple of days in the U.S. We’ve been blessed to have you here. Oh, I’d better wrap this up or your emotional old American friend will need to grab the Kleenex box again.